THIS might just be the ultimate Google search of all time. 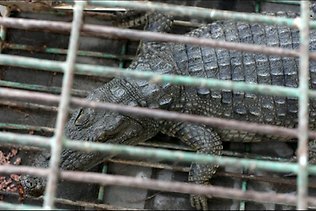 Yesterday in Gaza, Palestine two policemen captured a .75-metre crocodile that escaped from a zoo, right after they Googled how to catch it. Apparently local residents have lived the past two years in fear, afraid to leave their houses at night in case they were gobbled up by the croc. Now he?s safe and sound, back at the zoo in a new pond with four other crocodiles, everyone can breathe a little easier. "He had a lot of spirit in him. He wanted to be free, we hope he lives a good life here with his wives," said one onlooker. Quite aside from the fact that it took the cops two years to capture the scaly beast, the best thing about this story has to be how much we all use Google these days. Not so long ago you played pub trivia and games like Trivial Pursuit, just by using your brain and memory. We used cookbooks when we wanted to find recipes, and went to the doctor to find out the reason for a myriad of symptoms, rather than attempting to diagnose them for ourselves. We only saw images of space in books and sometimes on television. We relied on labels at the back of packets to tell us what ingredients meant, ditto calories. We flicked through hardcover road maps when we needed directions, and used White and Yellow Pages for phone numbers and addresses. We?d ask our friends or consulted an encyclopaedia instead of typing "how to: insert modern dilemma of choice" into a keypad. The world without Google also required us to be a hell of a lot more patient than we are now. It was OK to say stuff like, "I?ll get back to you tomorrow? because very few things were instantaneous. Also, the library was a place you actually needed to visit, rather than just hang out and "look? smart in. But then of course it was always that bit harder to catch crocodiles. What's the most random thing you've Googled?